"Displaying first 40 and last 40 comments. View all 155 comments or add a comment." 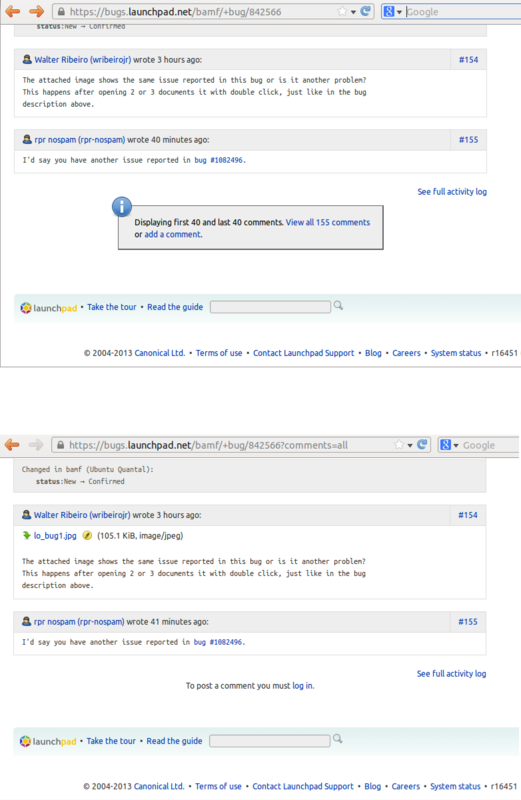 In this case an attachment added within a comment near the end of the page is not visible. On the other hand, if you enable viewing all comments, the hidden attachment shows up. I'd say that an attachment added within a comment should be always shown if the comment is not hidden. One way of fixing this would be to have view filters for the comments, including "All Comments" and "Attachments Only". Choosing "Attachments Only" would usually reveal any hidden attachments, since >40 attachments is much less likely than >40 comments. Fixed in stable r17688 <http://bazaar.launchpad.net/~launchpad-pqm/launchpad/stable/revision/17688>.